Eye: A golden, iridescent liquid. Nose: Initial nose of this great Grande Champagne Cognac reveals a top note reminiscent of cocoa, hovering over powerful, heavier scents of dried apricots, dried figs, prunes, creme-caramel and new leather. A sensuous, complex sniff. Palate: The supple entry slowly unfolds concentrated flavours of ripe stone fruits, dried figs and almond cake followed by a spicy vanilla and cocoa back palate. Exceptionally pure, very gently warming spirit. Impeccable balance. The aftertaste lingers with terrific persistence, drying with flavours of dried banana, creme caramel and cedary oak. The Pasquet Nostalgie is both a Limited Edition Cognac, and a delightful trip down memory lane throughout the last decade of the 20th century. Jean’s father, Jean-Luc Pasquet, was in a nostalgic mood when the 21st century rang in. For this blend, he combined the best Cognacs from each year of the decade past, from the years 1991 to 2000. It is the last of the blends created by Jean Luc. These vintages were left to mature before finally being assembled in 2008 to become a unique blend of the Extra Cognac age category. Jean-Luc and his son Jean selected a single barrel to be bottled at cask strength to celebrate the 40th birthday of the Cognac house. This limited run of only 500 bottles has produced a beautifully aromatic Cognac, with a round, smooth palate. 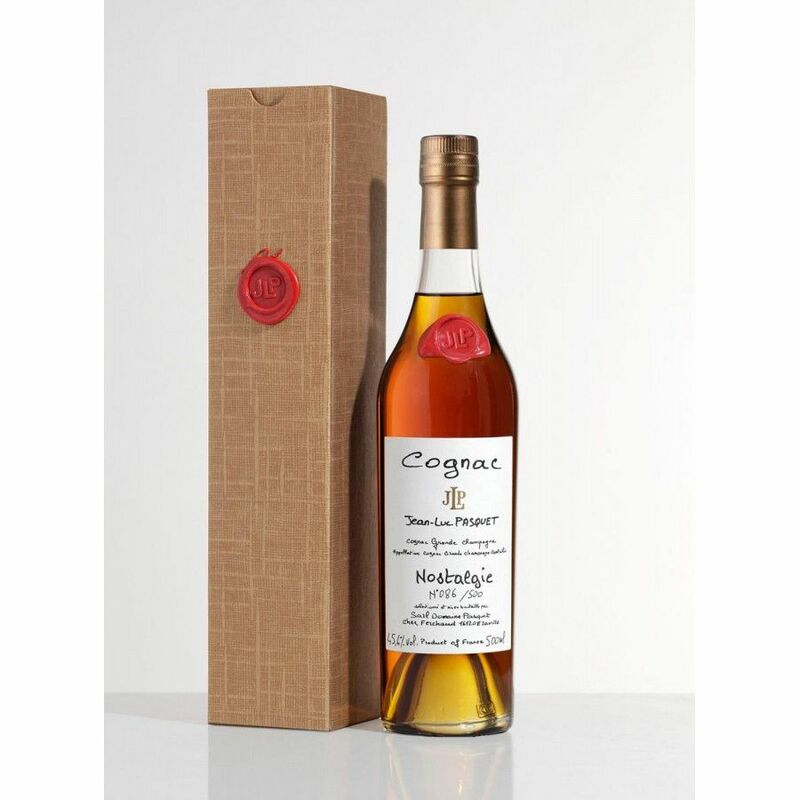 At around 23 years of age, this Cognac offers extraordinary value for money for such a quality, and is the perfect choice for any special occasion. The Pasquet Maison is the epitome of artisan production and organic farming. Located in the Premier Cru of Grande Champagne, and headed by Jean and his wife Amy, they continue their precious family traditions in creating Cognac. The Pasquet Nostalgie is packaged in a traditional slim bottle, with a simple and chic label. Savor this blend neat. We recommend letting it breathe in the glass over 10-20 minutes for maximum pleasure.